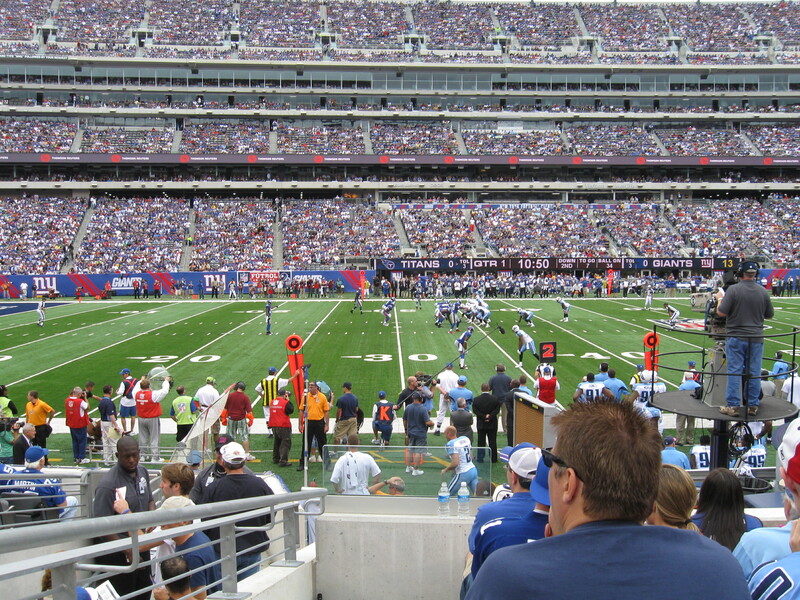 Last Thursday, I got a phone call from a friend who had a pair of tickets to the Giants-Titans game. I usually like to reserve judgement on new stadiums for a year or two…but you would be insane to pass this up. 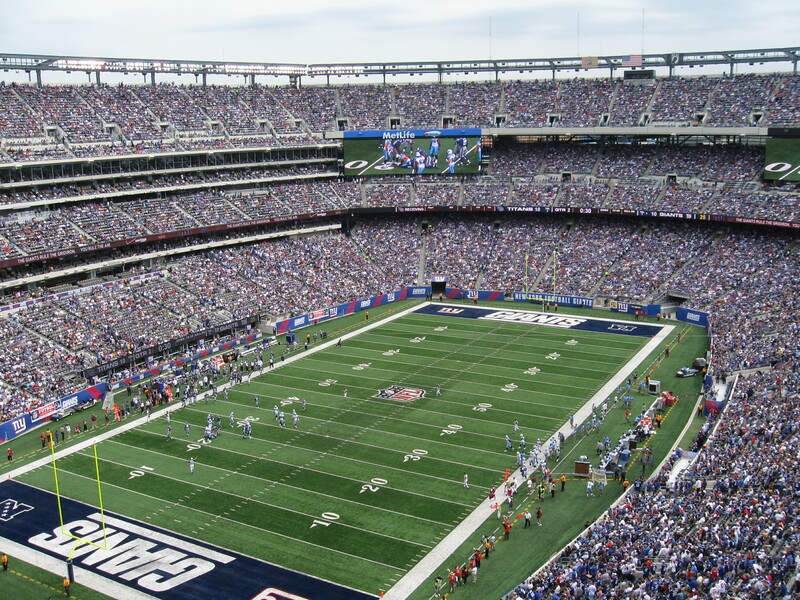 So it was off to the New Meadowlands Stadium in East Rutherford, NJ for only the second Giants regular-season game there. The first issue was how to get there. This “should” be a simple procedure, you drive to the Meadowlands Complex, which has 23,600 parking spaces and you tailgate or go to the game. Nope. 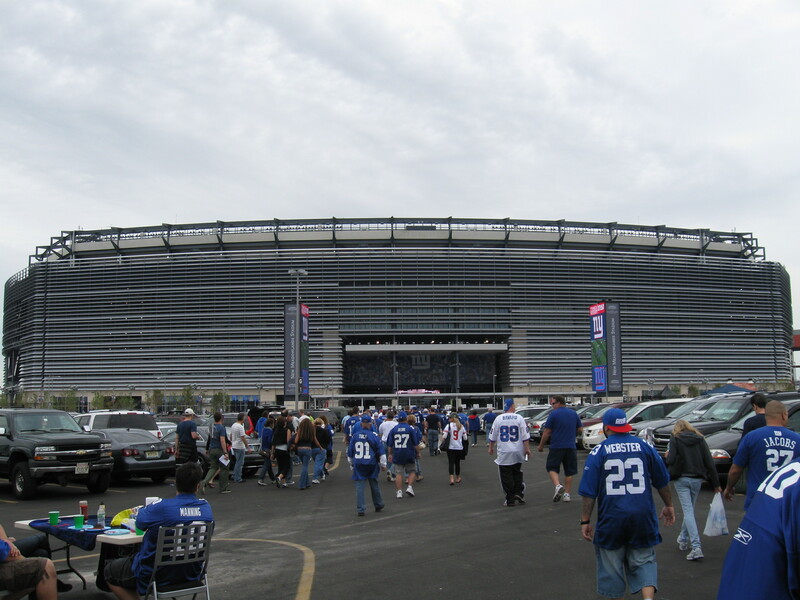 Now, if you don’t have a parking pass, they won’t allow you into the Meadowlands to park. You’re directed to this odd area of four or five office complexes in Lyndhurst, where there are small lots. A bus shuttle then takes you to Lot P in the complex and then another shuttle comes and brings you to the stadium. You still have to fork over $25 for both areas. I don’t understand why they did this and when we got there we met up with a tailgate and talking to some of the people there, it seems not all season-ticket holders got parking passes. Really screwed up if you ask me. The one good thing I will say about the off-site parking is the traffic arriving was nearly non-existent and leaving was very easy too (we took Rt. 17 North to hook up with I-80). There are other transportation means (NJ Transit/train or a bus to the Port Authority in Manhattan), which have had some problems thus far, but I would think get ironed out soon. The tailgating scene around the stadium was pretty good and Giants fans seem like a nice crowd to hand around with. Before the game, I also got to meet up with Gary Herman who runs the website, Royalty Tours USA. Gary has quite a busy schedule as he is at a live game just about every night, which is amazing. We met up once before at Citi Field and it was great to meet and chat again as he gave some of his thoughts on the new stadium. To be frank, the stadium is ugly. The outside is so drab and uninviting, for $1.6 billion couldn’t they have spruced it up a bit? I understand the neutrality becomes two teams call it home, but it just looks like these big silver blinds covering the entire exterior. 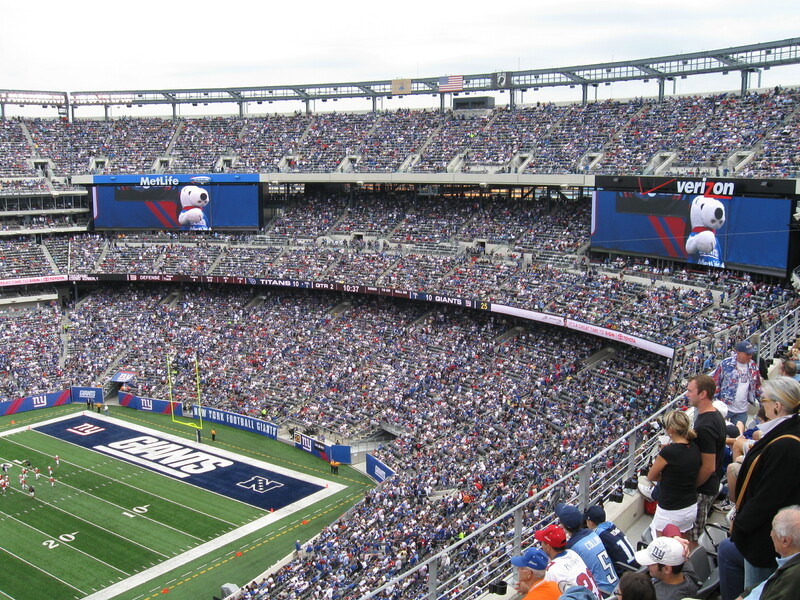 Inside, it has a similar look and feel to the old Giants Stadium: three levels surrounding and enclosing the field. The two most noticeable changes were the abundancy of club/luxury seating and the monster video boards. There are 10,000 club seats and 229 suites with most of the second level consisting of these. Some of these clubs are quite exuberant, especially the Coaches Club. As for the boards, I think four (one in each corner) is a bit overboard, but they incorporated them into the seating design as a large section of seats above the second level sits between these scoreboards. They are expectedly beautiful with HD video that is stunning. Our seats were terrific, Section 140 about 11 rows from the field at the 30-yard line (see picture below). I would never buy seats like this, so the opportunity to see a game this close was awesome and I kept getting distracted watching Rob Bironas warm-up and Jeff Fisher pace the sidelines. I didn’t get to explore as much of the stadium as I normally like to, but I did find aspects I liked a lot: The concourses had some really nice features, including the “Legacy Club” for the New York Giants. It’s a room with trophies, displays and mementos through the Giants history and though the room is small, it’s elegant and full of great items to study (including the three Lombardi Trophies and the busts of important/retired players). The coolest thing I’ve seen in the concourse through all my stadium trips was at this one food stand that had these gigantic video screens above them. One had on the Giants game feed, another had game stats and the last had the NFL RedZone feed (my favorite). Pretty awesome while your waiting in line! The food was great too…so much variety from Pepper & Egg sandwiches to Roast Pork to an abundance of Mrs. Fields Cookie stands. They also incorporated not only New York specialties (Nathan’s Hot Dogs, Corned Beef, Pizza, Knishes), but they even threw a bone to North Jersey by having Taylor Ham Sandwiches. Lastly, I loved the game-day atmosphere (though I would think it’s rare to find a bad NFL game atmosphere). Giants fans are loyal, loud and overall not rude or obnoxious. The focus is strictly on the game as there are no Giants Cheerleaders and hardly any music during breaks in game play. Fans will boo loudly if their player does something dumb (see Kareem McKenzie), but it’s a great crowd and the stadium was very loud early in the game and after a TD. As for the game…yikes. I’ve watched a lot of football in my life and the Giants gave a top-five performance in terms of undiscipline and mistakes. They had four or five unsportsmanlike penalty calls that had big impacts on the game. In addition, a chop block in the end zone led to a safety, a penalty took them out of field goal range and they had a lost fumble and interception inside the Titans ten yard line. New York was down 10-0, before tying it up before the half on an Ahmad Bradshaw 10-yard run. So despite the mistakes, they were still in it. However, Tennessee took control midway thru the third after the aforementioned safety and then a quick six play TD drive. They went on to win 29-10, despite being outgained by a whopping 200 total yards (271-471), which goes to show the amount of mistakes and penalties. Tennessee’s Chris Johnson ran 32 times for 125 yards, while Eli Manning threw for 386 yds. It was funny because during the game my Bills (who are so dysfunctional and had such a piss-poor offseason start to re-building) were somehow hanging with New England and I was anxiously awaiting a game highlight on the scoreboard to see what was going on. By the way, the weather for our game was as perfect as it gets. Skies were overcast, so the September sun wasn’t scorching down and the temperature was 70. Just perfect. That was only my third NFL stadium and I’m looking forward to adding on some more. As always, check my official review of the visit here: #93 New Meadowlands Stadium. My unusually busy stretch of new stadiums continues as I will visit my 14th college stadium and 94th official facility next Friday as I make the long awaited short trip to Rutgers Stadium. I’ll probably have some random post before that, otherwise enjoy the weekend…remember the Ryder Cup is on, go USA! Once again, you did an excellent job in breaking down your visit to a new stadium. I noticed that you said it was only your third NFL stadium. I consider myself the NFL king. I’ve been to 54 NFL stadiums by my way of counting. In addition, I attend on average 20 NFL games a year. This year I have 23 regular season games planned as per my post on my blog plus I saw a rare preseason game this year and I always see at least one playoff game too. I have done so every year since 1997.